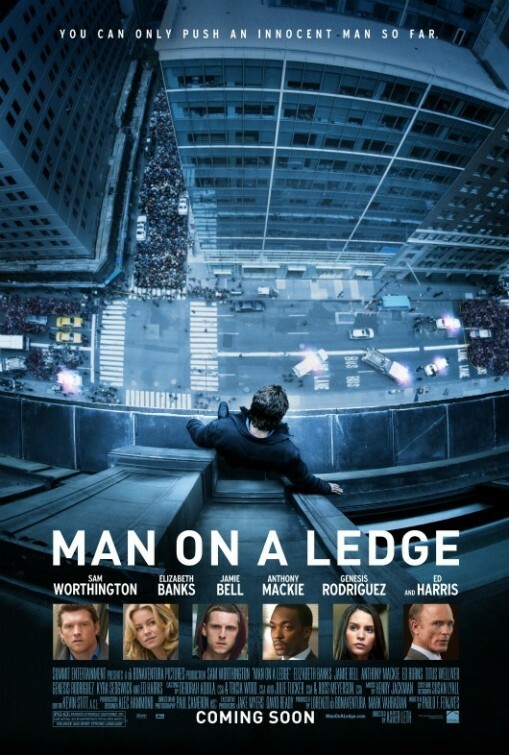 Man on a Ledge does something that no movie in recent memory has done: it combines two different types of movies, the "desperate man hanging off of a ledge" movie with a heist film, because the "man on the ledge" is covering up the bigger picture, a robbery happening at a nearby building. When you combine these two "genres" with an all-star cast, you get an interesting, crazy ride that never fails to hold the audience's attention throughout its 102 minute runtime. Former police officer Nick Cassidy (Sam Worthington, The Debt) was sent to prison for a crime he didn't commit - stealing the 40 carat diamond of one of New York's "movers and shakers," David Englander (Ed Harris, Salvation Boulevard) - and when he is released for a day for his father's funeral, he disarms the guards that were assigned to him and escapes. A year or so later, he finds himself perched on the ledge of the Roosevelt Hotel building, threatening to jump and saying that he will only talk to Detective Lydia Mercer (Elizabeth Banks, Our Idiot Brother). Once Mercer is retrieved, she tries to talk him down from the ledge, but she soon finds out that there is a lot more going on here than just a desperate man trying to commit suicide: Cassidy's brother, Joey (Jamie Bell, Jane Eyre) and his girlfriend Angie (Genesis Rodriguez, TV's Entourage), are breaking into Englander's safe to prove that he still, in fact, has the diamond, and the "show" that Nick is doing out on the ledge is simply a cover-up for this. Worthington, Bell, and Banks, in particular, are all great in this film. The film only employs one flashback, to show how Worthington escaped prison, and it makes ample use of this; I feel that if they had shown more flashbacks, such as how Worthington ended up on David Englander's police detail, it might have dragged the film down a bit. Harris is perfect as the villain here, too, and Edward Burns (27 Dresses) and Anthony Mackie (The Adjustment Bureau) play other police officers, Mackie being Nick's former police partner, who are involved with the incident on the ledge. In addition, Kyra Sedgwick (TV's The Closer) has a bit part as a news reporter who is trying to get the scoop on identifying "the man on the ledge" (Cassidy) and his motivations for being there. Yes, definitely see this film. The film is super slick and even throws a few twists in near the end, and it's interesting to see how no one else except Nick Cassidy and his brother believed he was innocent. Worthington and Banks quickly establish a rapport, and he mentions that he chose her because of her involvement and engagement with past "jumpers"; her past makes the other policemen not trust her to get Worthington down from the ledge. It goes by so quickly, in fact, that I didn't check my watch until about an hour and a half in to the movie, and only then because I knew it would be ending soon; and the ending itself does not disappoint. 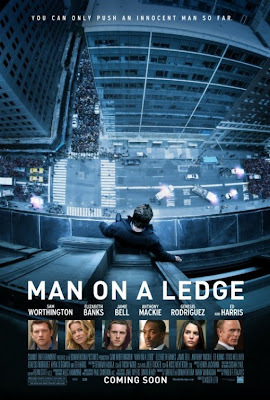 Man on a Ledge is in theaters today, January 27th, and is rated PG-13 with a runtime of 102 minutes. 4 stars out of 5.